Lamb dressed as Mutton: Dead Boss, Live at the Electric and more! Dead Boss, Live at the Electric and more! My exams are over, I am back home and the TV is most definitely on! Firstly Dead Boss. Written by Sharon Horgan and Holly Walsh and starring none other than JENNIFER SAUNDERS! The first two episodes were shown last week. I had high expectations because of the amazing cast, and sometimes that is not good, because rarely programmes live up to their expectations. This meant that I was pleasantly surprised when I watched it. It's about a women who is falsely accused of murdering her boss and is sent to prison. O and it's a comedy and is hilarious. The casting is spot on and it is so weird and the characters are so bonkers it just works. The next episode is on tonight at 10:30 on BBC 3 and I highly recommend that you catch up on i-player and watch it tonight! Secondly, Live at the Electric. Hosted by Russell Kane, it is a sort of Michael McIntyre's Comedy Roadshow-type programme that features sketch comedians and character comedians. I wanted to watch it because I have seen Lady Garden live and really enjoyed it. It wasn't as good as I had hoped, each act only gets a small time and some of it isn't even live. Having said that some bits are really funny, but beware it is not light comedy. Moving away from comedy Lewis has been and gone and it was brilliant as ever. 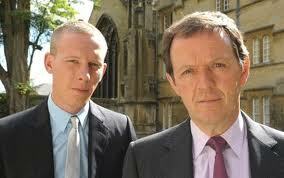 With Kevin Whateley and the devine Laurence Fox, set in Oxford, it is one of my favourite detective programmes. It is quite a slow burning programme and sometimes I get a little bored during the episode, having said that the last series was a lot better. Unfortunately it has just been announced that the next series is its last, but let's hope it goes out in style! The next couple of weeks, sees some new programmes airing. Psychobitches starts tonight at 9 on Sky Arts 1. Parents starring the wonderful, gorgeous Sally Phillips is coming to Sky 1 soon and Jennifer Saunders is soon to star in another BBC programme Blandings. So there is a lot to look forward to. Let me know what you think of Live at the Electric and Dead Boss tonight!